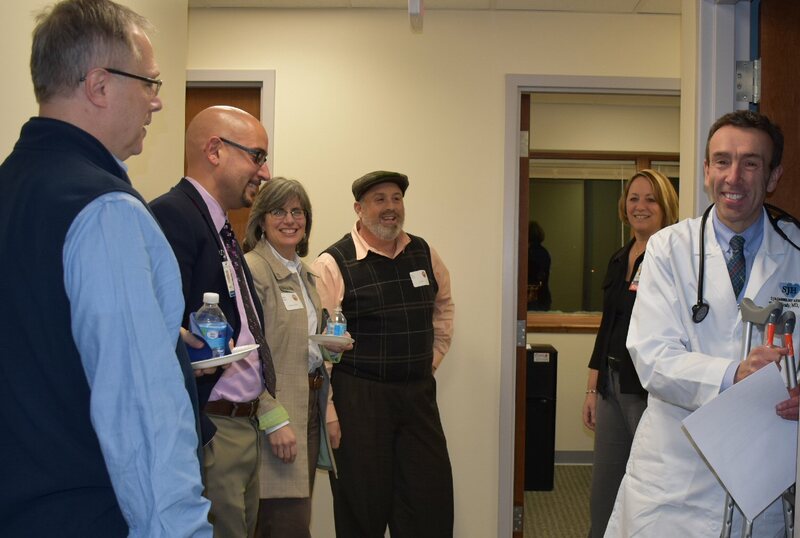 OSWEGO, NY – Area business leaders had the opportunity to meet Oswego Health physicians and tour the renovated second floor of the health system’s Oswego Health Services Center during a recent Greater Oswego-Fulton Chamber of Commerce Business After Hours event. Oswego Health hosted a Greater Oswego-Fulton Chamber of Commerce Business After Hours event recently. 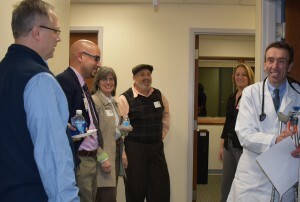 Nearly 40 people attended the event held on the second floor of the Oswego Health Services Center, where they were able to meet the physicians and tour their offices. In the photo from left are Wallace Dengo, of National Grid; Jason Santiago, Oswego Health Vice President and The Manor’s Chief Operating Officer; Ellen Clark with Experience Oswego and Lighthouse Co-Works; Kurt Ferris, of Prudential Financial; Christine Close, Oswego Health Director of Physician Practices and Oswego Health Cardiologist Thomas Grady Jr., MD. Oswego Health recently rebuilt suite 280, located on HSC’s second floor suites to house both its cardiology and orthopedic practices. The new suite features a larger, comfortable waiting area and more patient exam rooms, all for better efficiency of care. The orthopedics providers include Orthopedic Surgeons John Ayres, MD, and Jerod Hines, MD, along with Physician Assistant Dan Birklin. Providing cardiology care are Cardiologist Thomas Grady Jr., MD, and Physician Assistant David Downey. Those attending the BAH could also tour the offices of Otolaryngologists Melanie Pence, DO, and Nicholas Groch, DO, who provide ear, nose and throat care in suite 210, which is also on the second floor of the HSC. Adjacent to the ENT suite, is Oswego Health Audiology, where Audiologist Karah Gottschalk, offers a wide range of hearing and balance services, including fitting individuals for hearing aids. The Oswego Health BAH was the first such event for the new year.